Tunisia: WAT.TV, the 3rd video-sharing website to be blocked! Few days ago, the Tunisian regime has blocked access to WAT.TV, a social networking and media-sharing website, which is believed to be the 3rd video broadcaster on the Internet in France. This is also the third video-sharing website to be blocked in The country. First they blocked Dailymotion on September 3rd, 2007, then it was the turn of Youtube to be banned from the country Internet on November 2nd, 2007. But while Youtube and Dailymotion have been banned because of videos that mock President Ben Ali and expose the country's human rights abuses, WAT.TV seems to be blocked because of the broadcasting of the activities of the opposition Ettajdid Movement (legal, former communist party). Indeed, the Ettajdid Movement has embraced the Internet during and after the 2009 presidential and legislative elections, whose leader, Ahmed Brahim, ran for Tunisia's presidency (won 1.57%, according to the Interior ministry). 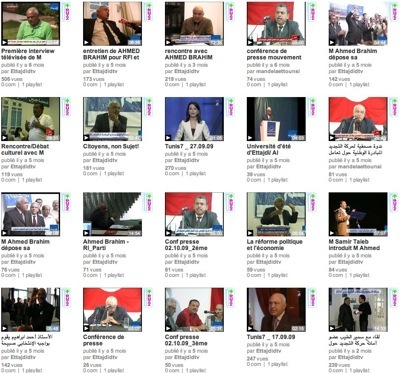 Ahmed Brahim's channel on WAT.TV has dozens of videos by his campaign and by supporters.